Read the first NBC report on JTRIG and the Snowden documents. Read an earlier exclusive NBC report on the Snowden documents. Intelligence officials defended the British government’s actions as appropriate responses to illegal acts. 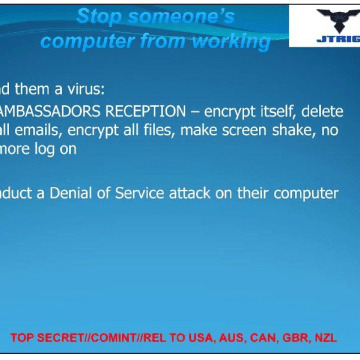 According to notes on the 2012 documents, a computer virus called Ambassadors Reception was “used in a variety of different areas” and was “very effective.” When sent to adversaries, says the presentation, the virus will “encrypt itself, delete all emails, encrypt all files, make [the] screen shake” and block the computer user from logging on. But the British cyber spies’ operations do not always remain entirely online. Spies have long used sexual “honey traps” to snare, blackmail and influence targets. Most often, a male target is led to believe he has an opportunity for a romantic relationship or a sexual liaison with a woman, only to find that the woman is actually an intelligence operative. The Israeli government, for example, used a “honey trap” to lure nuclear technician Mordechai Vanunu from London to Rome. He expected an assignation with a woman, but instead was kidnapped by Israel agents and taken back to Israel to stand trial for leaking nuclear secrets to the media. The version of a “honey trap” described by British cyber spies in the 2012 PowerPoint presentation sounds like a version of Internet dating, but includes physical encounters. The version of a “honey trap” described by British cyber spies in the 2012 PowerPoint presentation sounds like a version of Internet dating, but includes physical encounters. 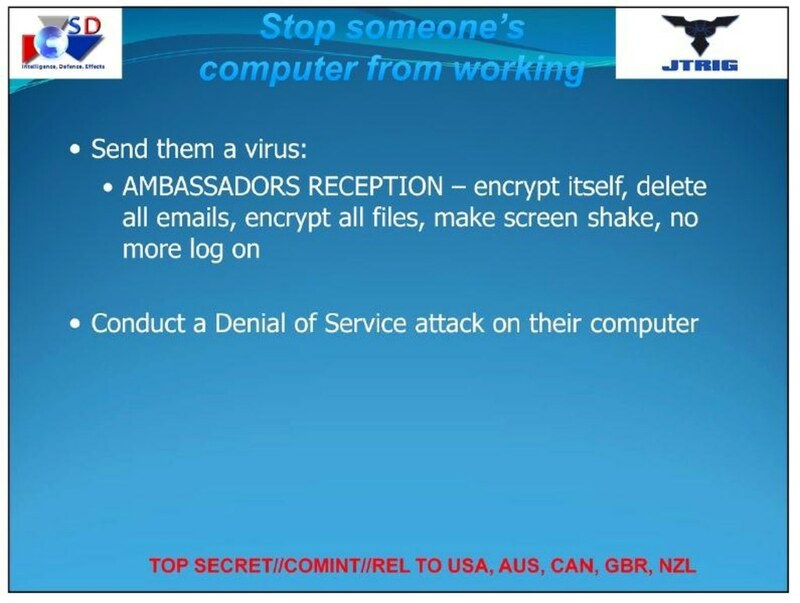 The target is lured “to go somewhere on the Internet, or a physical location” to be met by “a friendly face.” The goal, according to the presentation, is to discredit the target. A “honey trap,” says the presentation, is “very successful when it works.” But the documents do not give a specific example of when the British government might have employed a honey trap. An operation described in the 2010 presentation also involves in-person surveillance. “Royal Concierge” exploits hotel reservations to track the whereabouts of foreign diplomats and send out “daily alerts to analysts working on governmental hard targets.” The British government uses the program to try to steer its quarry to “SIGINT friendly” hotels, according to the presentation, where the targets can be monitored electronically – or in person by British operatives. The 2010 presentation also describes another potential operation that would utilize a technique called “credential harvesting” to select journalists who could be used to spread information. According to intelligence sources, spies considered using electronic snooping to identify non-British journalists who would then be manipulated to feed information to the target of a covert campaign. Apparently, the journalist’s job would provide access to the targeted individual, perhaps for an interview. The documents do not specify whether the journalists would be aware or unaware that they were being used to funnel information. The executive director of the Committee to Protect Journalists, Joel Simon, said that the revelation about “credential harvesting” should serve as a “wake up call” to journalists that intelligence agencies can monitor their communications. Simon also said that governments put all journalists at risk when they use even one for an intelligence operation. “All journalists generally are then vulnerable to the charge that they work at the behest of an intelligence agency,” said Simon. In Afghanistan, according to the 2012 presentation, the British used a blizzard of text messages, phone calls and faxes to “significantly disrupt” Taliban communications, with texts and calls programmed to arrive every minute. The documents from 2010 note that “Effects” operations, GCHQ’s offensive push against Britain’s enemies, had become a “major part” of the spy agency’s business. The presentation from 2012 illustrates that two years later GCHQ had continued to shift its workload from defending U.K. cyber networks to going on offense -- targeting specific people or governments. The British government’s intelligence apparatus, which also includes MI5 and MI6, had a role in the 2010 Stuxnet computer virus attack on Iran’s nuclear facilities, according to sources at two intelligence agencies. GCHQ would not comment on the newly published documents or on JTRIG’s “Effects” operations. It would neither confirm nor deny any element of this report, which is the agency’s standard policy. In a statement, a GCHQ spokesperson emphasized that the agency operated within the law.